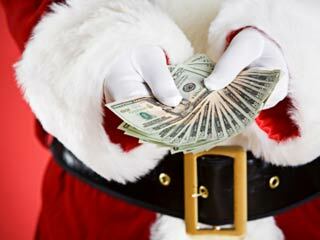 Forrester estimates that online retail sales will reach $44.7 billion this holiday season. That is a 8% increase year over year. The contributing factor is the increase in buyers doing more of their shopping online, as well as retailers focusing a larger portion of their marketing dollars on internet sales. Here are some important stats to take from their report. Retailers plan on keeping smaller inventories, increase customer support, and enhance the website with greater usability and social media tools. 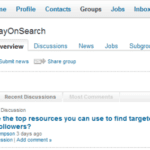 The number of searchers for coupon related searches is up from 2008. That means that consumers are being more careful with every dollar they spend. Sites like RetailMeNot, FatWallet, and SlickDeals aggregate coupons, promo codes, and special offers from hundreds of retailers to help consumers save money. DealTaker.com is leveraging Twitter to promote their site and give online shoppers an easy way to find coupons to stores they are looking for. Simply tweet @couponbot “store name” and DealTaker will reply to your tweet with the most current coupons/promos for that store. There are a number of online retailers who are giving some insights as to which products they feel will be the hot products for the holidays. 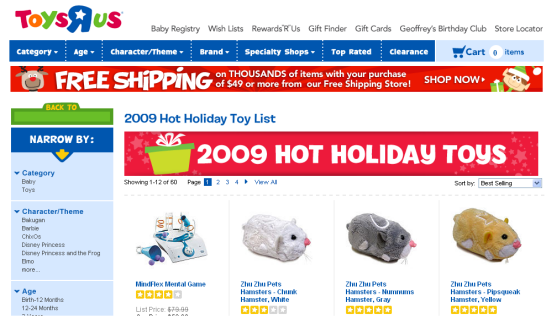 Huge Toy Retailer Toys R Us created the 2009 Hot Holiday Toy List that have been hand picked to highlight the most popular toys throughout the year. Amazon.com has a toy list of over 400 toys, games, sports gears, movies and gadgets to help you find great gifts for this upcoming holiday season. For those who are not familiar with the term “Cyber Monday“, it is the internet’s equivalent to Black Friday. It marks the beginning of online shopping for the upcoming holiday season. 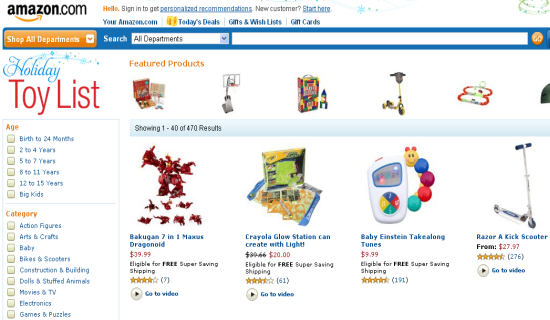 Online retailers offer amazing deals to entice online shoppers to purchase gifts for the holidays. 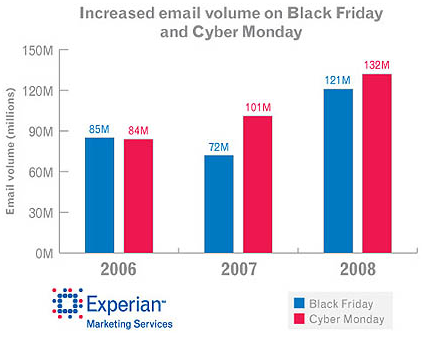 Historically, there has been an increase in sales on Cyber Monday, however from 2007 to 2008 there was a slight decrease. To make up for the down economy and people spending less, retailers are trying to promote holiday specials earlier than normal to try and make up for lost revenue. 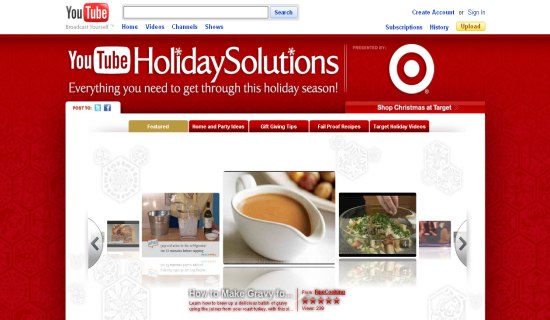 YouTube and Target have partnered to give you Holiday Solutions. Your one stop shop for house/party ideas, gift giving tips, party recipes, and holiday related videos. This is a unique way for both YouTube and Target to engage with online shoppers, by offering a free resource for the holidays. With useful content and holiday products built right into this Holiday Solutions YouTube channel, Target can take advantage of people looking to purchase products/gifts for upcoming holiday parties. The Google Retail Advertising Blog wrote a post about how to give incentives to your online shoppers. Even in a down economy there are still people buying, they are just more cautious. With that being said, over 260 retailers are participating in National Free Shipping Day to try and lure more buyers. In another related post, Google talks about when people are likely to purchase during the holiday season. 46% of consumers plan on purchasing the majority of their gift during early or late December. 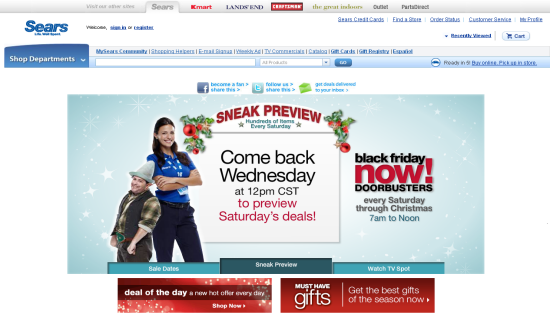 Sears is using their “Black Friday Now! 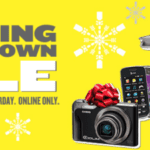 Doorbusters” promotion to try and extend the busiest shopping day of the year, by offering black friday deals every Saturday through Christmas.